As we keep witnessing how the iPad is entering a whole bunch of new markets for tablets that perhaps never thought they would be making it that far, while being taken by storm by the iPad itself like they are at the moment, here I am, once again, ready to go and share with you folks the next blog post from the series of My Top 5 iPad Apps of the Week, this time around with Week #9. First though I would want to share with you folks a couple of rather helpful articles you may want to check out, specially, if you are a librarian or perhaps an English language teacher. They are just basically a couple of articles with plenty of helpful tips and recommendations on Apps to check out, specially for those two groups, which I am sure is going to keep you all busy for a while. To name: “40 iPad Apps That Librarians Love” and “iPad Apps for English Language Teachers“, respectively. And now that we are over with that short introduction, let me recommend you as well to read one of those posts a good friend of mine put together just recently and that sounds incredibly scary as to how well he has described not only his own iPad experience so far, but mine, too! Check out Jim Worth‘s “What’s so special about the iPad“… Yes, indeed, that’s exactly how I feel about it myself: special! Some of Jim’s thoughts on what appeals to him about the iPad would also be very true for me: the always Instant On, the All Day Battery Life, the Portability, the Continuous and Free Software Updates, the Social Web, the Video and Audio Capabilities and, of course, the games, the brilliant games that I have been playing there now for a few months and that helped my gamer self resurface once again from the good old times! However, there are still plenty of other things for which I *heart* my iPad experience and very shortly I will be putting together another blog entry where I will try to cover the main reasons as to why I gave in a few months back, bought my iPad, while in the US, and haven’t walked back ever since! The always inspiring Paul Gillin already hints some of the topics I will be covering as well in that upcoming blog post in a recent entry he wrote under the title “Age of the Tablet Has Begun“, which, I am sure you would agree with me, has got a very suggestive title of what’s to come in the new year we are approaching fast and furious. Indeed, Paul is just basically detailing how he feels the iPad, and other upcoming tablets, whenever they come out!, are going to change the whole concept of mobility and portability, even beyond that one of ultra-portable devices like netbooks or the MacBook Air, to name a couple. And I think he is absolutely right and spot on on that one, since the last couple of months, while I have been on the road myself in various different business trips, I, too, have experienced what it is like just relying on my iPad while presenting to customers, or being immersed in workshops, attending & presenting at conference events, etc. etc. and just having to rely effectively on my iPad alone. Like I said, there are several other reasons as to why the iPad is probably that particular device that has changed, the most substantially over the last 6 months!, the way I interact with my own working environment, whether behind the firewall or outside. It’s that device that has certainly brought back a level of comfort that I felt I was losing time and time again when having to spend too much time in front of the Mac itself. Now I can still keep up and have that mobility I once thought I lost it for good! But you will find out plenty more about the rest of the other benefits I am getting from my own iPad experience in that upcoming post. For now though, I am going to go ahead with the usual sharing of the “My Top 5 iPad Apps of the Week“, this time around for Week #9 picking up those Top 5 iPad Apps from the ones I keep sharing every so often over at my Twitter acount under the hash tag #elsuapps. So if you would want to see which ones I am sharing on a daily basis, you may want to subscribe to the Twitter feed from that hash tag. As usual, this set of recommendations helps me in two different areas: first, as a way for me to recommend some of the iPad Apps I have been enjoying quite a bit as of late, as more and more of my friends and colleagues are purchasing their iPads and want to know which ones I have been enjoying the most and, secondly, a method for me to remember and capture them over here in my own blog, since Twitter doesn’t want to do a proper job at it, at least, for now. In a way, it’s like my own Personal Knowledge Sharing iPad tips! As usual, I will be recommending 5 different Apps, one of which is the iPad Game of the Week and the others are Apps I keep using on a regular basis for a bunch of tasks and activities, both for work and for personal use. I will also try to keep the reasons why I am recommending them a bit short and include the link to them in iTunes, so you can have a look into them right away and without delay, should you be interested in any of them. And, as always, if you would have any other iPad apps you yourself would want to recommend, share them across in the comments section, and I will incorporate them into future posts as well. The more, the better! XpenseTracker – (Expense Tracker & Mileage Log): This is one of my favourite iPad Apps to keep track of expenses, both personal and work related, specially, for when I am in the road and need to keep track of them in order to declare them at a later time, for the work ones, and to keep an eye on things for the personal ones. It’s just as good as it gets, in my opinion, more than anything else because it allows you to get the job done easily and, most importantly, export it elsewhere for easier processing while handling those expenses. A must-have for those travel warriors out there! Slide by Slide: My good friend Stu McIntyre recommended this one a little while ago over at the This Week In Lotus podcast as perhaps one of the most powerful iPad Apps to view, digest and share across presentations stored in one of our favourite Web 2.0 tools available out there: Slideshare and after having used it myself for a little while now I can confirm it just rocks!! It’s my default viewer for Slideshare decks at the moment and the ease of use it has along with the lack of ads surely makes it a treat working with it, specially when you are hunting down for ideas and other thoughts to reuse for your upcoming presentations! Very very helpful! Google Earth: At this point in time, there is probably very little that I would need to add about Google Earth that may not have been said yet about it, but if I can add my ¢2 I could probably say that the experience in an iPad is fantastic! Having that ability to check out places, while on the move, to see where you are going, what you need to do, places to check, people to meet in places you never heard about, show everyone where you live or where you work in a way they, too, can interact with it at the same time as you are, is just priceless! It’s just like having that wonderful thing we call World right at your fingertips! Amazing! This is one of those Apps I really enjoy using with people who have never used the Web, nor are they interested in it. Yes, I know, there are still plenty of people out there in that realm and they all *love* the Google Earth iPad App… I can’t blame them for it. I do, too! And that’s it for today, folks! 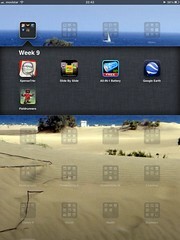 Very soon I will be putting together the next one which will make Week #10 of My Top 5 iPad Apps of the Week. Stay tuned for that one to come up! For now, I would want to wrap up this blog entry by reminding folks to check the blog post for Week #8, where I shared the tip about AppShopper, which given the time of the year we are in, is a must have, an essential iPad App to have, to catch all of the best deals and sales offers that most Apps are already offering during the holiday period. You may want to give it a go and see what you find! Some of the gems I have bumped into over the last week or so I have got them for almost no money just waiting for the bargains to kick in! Don’t miss out either!